Flip Flop Art – This video is only 60 seconds long but that’s all you need to be inspired by the creativity of this wonderful project. It’s great for the environment, it’s great for those it employs and it’s just plain COOL! 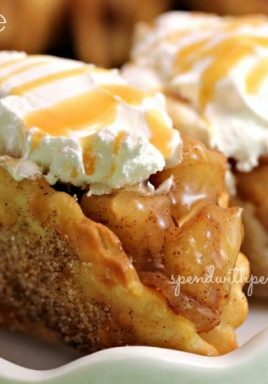 APPLE PIE TACOS! Okay, so I haven’t tried this recipe yet but how delicious do these look? I would love one right now! If you try them before I do, please come back and let me know how they turned out. “Oh…that’s an old typewriter,” she answered, thinking that would satisfy their curiosity. “Well what does it do?” they asked. “I’ll show you,” she said and returned with a blank piece of paper. She rolled the paper into the typewriter and began striking the keys, leaving black letters of print on the page. Uh, yeah. 🙂 Have a lovely Saturday! ← Is Christ at Home in Your Heart?